Maximizing Progress: Animals Without Borders ~ New KAZA Peacepark! 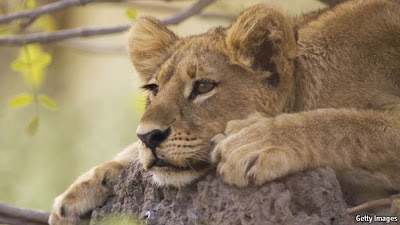 "A rare bit of good news for wildlife in Africa, last week saw the launch of the world's biggest conservation area stretching across five southern African countries -- Angola, Botswana, Namibia, Zambia and Zimbabwe. 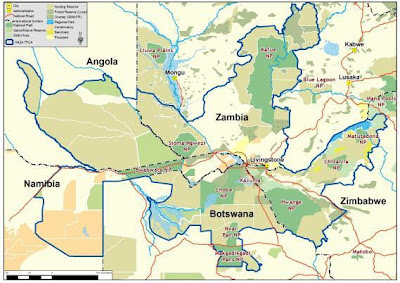 The Kavango/Zambezi Transfrontier Conservation Area (KAZA) has been in the works since 2003; a memorandum of understanding was inked in 2006, followed by a fully fledged treaty to establish the park in August 2011. The area under conservation has expanded during the process, from under 300,000 to 440,000 square kilometres, nearly the size of Sweden. [...] The hope is that a co-ordinated approach will be more effective..."